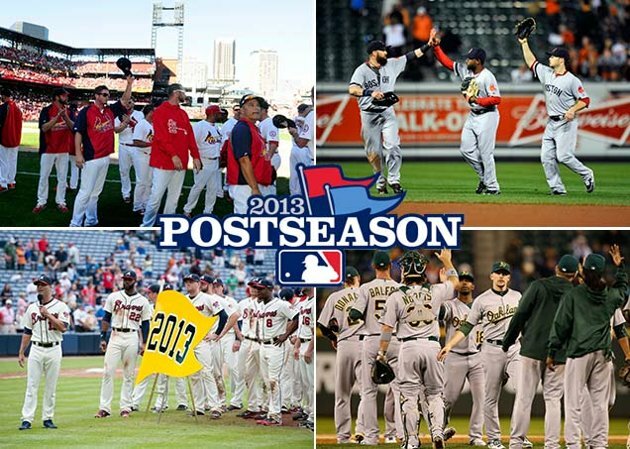 For much of baseball history the postseason consisted of just the World Series. That changed in 1969 with the addition of the league championship and again 1995 with wild card round. More playoff series mean more drama, and below we countdown the 10 greatest non-World Series postseason matchups in baseball history. The 1997 ALCS match up between Cleveland and Baltimore will be remember for its close games and a couple bizarre plays on pitched balls. The teams split the first two, setting up a game three duel between aces Mike Mussina and Orel Hershiser that was tied at one after nine. In the bottom of the 11th Indians’ shortstop Omar Vizquel came up with one out and a runner on third. He motioned to bunt but missed a pitch that went right through the strike zone and also eluded catcher Lenny Webster, leading the Orioles and their fans to believe the ball was tipped. However it was ruled a clean strike, and the winning run scored. Things got unusual on another pitched ball Lenny Webster didn’t catch in game four when a wild pitch from Arthur Rhodes allowed two runners to score when none of the Orioles bothered to cover home plate. This proved to the be the difference in the Indians’ 8-7 victory. The O’s staved off elimination with a 4-2 win in game five and then got another masterpiece from Mussina in game 6. However, Moose’s eight innings of one-hit baseball weren’t enough and the Indians prevailed 1-0 in the bottom of the 11th, taking the series in six games. The Oakland A’s dominated the first half of the seventies, winning three straight World Series. But they almost got tripped up before their three-peat even started by the Detroit Tigers in a 1972 ALCS that was a battle in more ways than one. Oakland, the heavy favorite, took game one 3-2 in come from behind fashion, plating two in the bottom of the 12th. Their 5-0 game 2 victory was a little easier, but an incident in the seventh inning in which the team’s brawled on the field after A’s shortstop Bert Campaneris was hit by a Lerrin Lagrow pitch and responded by throwing his bat at Lagrow set the tone for the rest of the series. With both Campaneris and LaGrow suspended for the rest of the ALCS, the Tigers evened the series by winning game three and then taking game four 4-3 with a with a three spot in the bottom of the tenth. The Tigers took a 1-0 lead in the first inning of the deciding game five but couldn’t muster any more runs against A’s star pitchers Blue Moon Odom, who started the game, and Vida Blue, who pitched the last four innings in relief. Oakland ultimately prevailed 2-1. Amid allegations from the Mets that he scuffed the baseball, Houston Astros hurler and 1986 Cy Young Award winner Mike Scott took game one of the 1986 NLCS over 1985 Cy Young Award winner Doc Gooden in a 1-0 pitcher’s duel . And that wasn’t even close to the best game of the series. The Mets rebounded in game two. Then they won game three 6-5 in dramatic walk off fashion thanks to a 2-run Lenny Dykstra homer. Mike Scott was dominating once again in game four, evening the series 2-2, only to see the Mets take game five 2-1 in 11. And that set up a game for the ages. The Mets trailed 3-0 in the top of the ninth of game six with a seventh game looking inevitable before a Dykstra triple started a three-run game tying rally. Both teams scored a run in the 14th and the Mets seemingly busted the game open and clinched the series in the top of 16th with a three spot. But the Astros rallied for two in the bottom of the inning before Mets pitcher Jesse Orosco — who won three games in the series — struck out Kevin Bass with two runners on to end the 4 hour 42 minute contest. We all know about the 86 World Series between the Red Sox and the Mets. And, like the Mets, the Red Sox played a pretty epic League Championship series to reach that famous Fall Classic. After a see-saw first three games the Angels had a two games to one lead. And sticking with the trend, the Red Sox took a 3-0 game four lead into the bottom of the ninth behind the pitching of Roger Clemens. However Clemens faded in the ninth, giving up a solo homer and two singles before being removed. 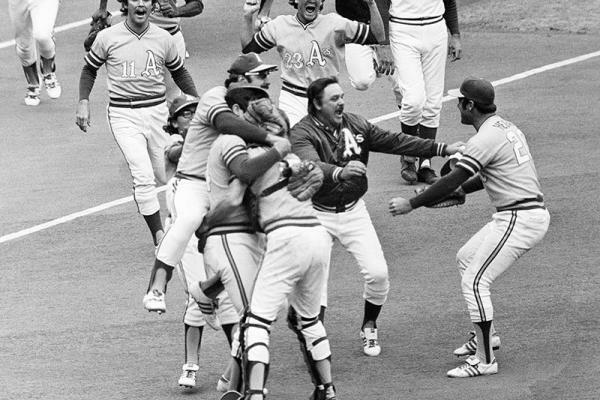 Calvin Schiraldi couldn’t clean up Clemens’ mess and the Angels tied it in the ninth before beating Schiraldi with a run in the 11th, leaving them a game away from the first ever World Series appearance. They would be a strike away in the top of the ninth of game six. But a Dave Henderson two run homer gave the Red Sox a 6-5 lead. The Angels would scrap back with a run in the bottom of the inning. However Henderson struck again in the top of the 11th, this time with a sacrifice fly, and the Red Sox held on for a 7-6. In 1980, neither the Philadelphia Phillies nor the Houston Astros had ever won a World Series, despite over 100 years of combined baseball. The champion-less National League division winners fought desperately for the right to represent the National League in the ‘80 Fall Classic and the result was one of the most thrilling series in postseason history. The Phillies took game one behind Hall of Fame pitcher Steve Carlton 3-1. It was a hard fought come-from-behind win and it was also the only game in the best-of-five series that didn’t go into extra innings. A four run top of the tenth clinched Game 2 for the Astros, 7-4, after Philly had tied it in the bottom of the eighth. Game three was a 1-0 classic, with Astros knuckleballer Phil Niekro going 10 scoreless and Houston winning it in the bottom of the 11th on a Joe Morgan triple and Denny Welling sac fly. Up two games to one and with the final two in the Astrodome, Houston looked to be in good shape. But the Phillies fought back, using ten innings to take game four 5-3. Then Philadelphia overcome a 5-2 seventh inning game five deficit to clinch the series 8-7 with Gary Maddox delivering the winning hit in the top of the tenth. Baseball’s losingest franchise then went on to win their first ever World Series. With World Series wins in 2004 and 2007 the Red Sox were on the cusp of a mini-dynasty in 2008. But first they had to get past the upstart Tampa Bay Devil Rays in the ALCS. The division rivals split the first games in the series before the Rays offense, led by Evan Longoria and Carlos Pena exploded for 9-1 and 13-4 victories in games three and four. The Rays kept rolling, jumping to a 7-0 lead in game five behind Longoria’s fourth home run of the series. Then things got interesting. The Red Sox scored eight runs in a row to take game five and then won game six 4-2 behind the strong pitching of 2007 postseason hero Josh Beckett. In the deciding game seven Boston took a 1-0 first inning lead on a solo home run by Dustin Pedroia. But the Rays calmly chipped away behind the pitching of Matt Garza and took the series with a 3-1 victory. In addition to all the see-saw dramatics, the 2008 ALCS featured a postseason record 26 home runs, including four each from Longoria and BJ Upton. Neither participant in the 1995 ALDS — the first division series in baseball history — ended up making it to the World Series. But thanks to the competitive nature of the five game set and the legendary players involved it still makes this list. The Yankees, who were in the midst of an unprecedented 17-year World Series title dry spell, featured Wade Boggs, Don Mattingly, David Cone, Mariano Rivera and Paul O’Neill. The Marines countered with Randy Johnson, Ken Griffey, Edgar Martinez and young pup named Alex Rodriguez. The compressed series was fast and furious, with the Yankees going up 2-0 after a 7-5 Game 2 win in 15 innings. Seattle took game three behind Johnson and then scored five runs in the bottom of the eight to even up the series with an 11-8 game four win. In game 5 Seattle was trailing 4-2 in the bottom eighth when Griffey’s fifth homer of the series and bases loaded walk tied it it. The Yankees took a 5-4 lead in the top of the 11th before an Edgar Martinez two-run double — still the most famous hit Mariners’ history — won the series. The Yankees would go onto to win four of the next six World Series, while the Marines would never really sniff a Fall Classic despite of some terrific regular seasons. But on that September day Seattle slayed the Evil Empire. 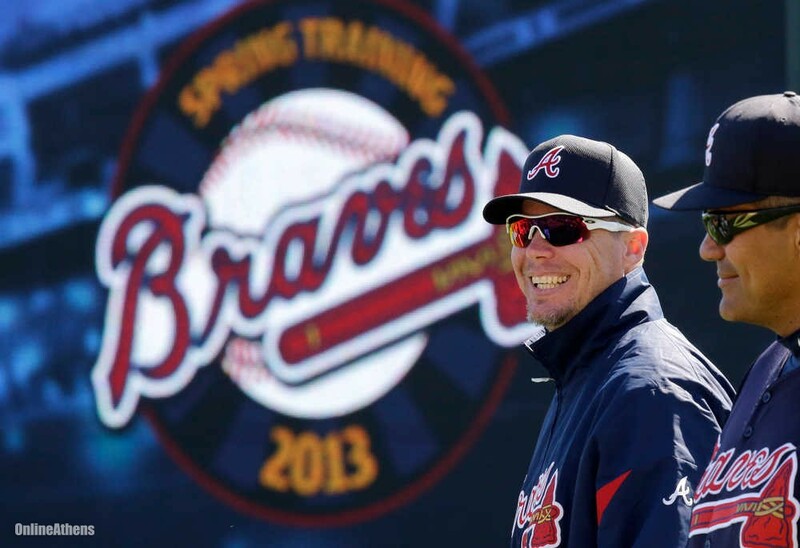 After a season in which the New York Mets and Atlanta Braves battled in the National League East standings and through barbed quotes in the tabloids, the two bitter rivals met in the NLCS. It was the seventh of 14 straight playoff appearances for the Braves and in the first three games of the series the Braves did what they did best — shut down the Mets with their superior pitching. With Greg Maddux, Kevin Millwood and Tom Glavine already getting their wins in the Braves had John Smoltz on the mound in game four, and he pitched them 2-1 lead in the eighth. But that wasn’t enough as John Olerud’s two run double of off controversial Braves closer John Rocker gave the Mets their first win of the series.. The Braves jumped ahead 5-0 in the first inning of game six, but the Mets the-never-say-die ended up tying it up and forcing extra innings. The Braves won the game 10-9 and reached their fifth World Series of the decade on a walkoff walk to Andruw Jones in the bottom of the 11th. The first two games went according to plan, with the Cardinals prevailing thanks to a barrage of homers from Albert Pujols and Scott Rolen. The Astros” Killer B’s” struck back in games three and four with Berkman and Beltran each homering twice in the two Houston wins. The pitching finally showed up in game 5, and a zero-zero duel between the unlikely pair of Woody Williams and Brandon Backe became a 3-0 victory for Houston thanks to a three-run walkoff bomb from Jeff Kent in the bottom of the ninth. 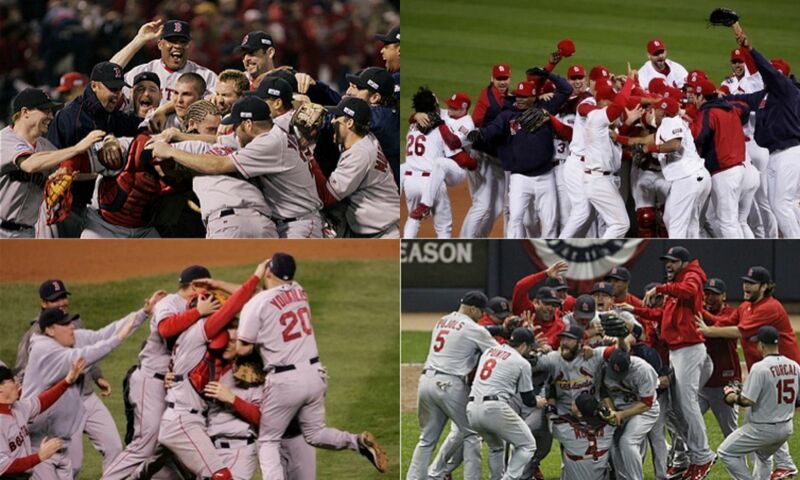 Back to St. Louis for game six, and more walkoff home run heroics. This time from Cardinal Jim Edmonds who tied the series with a two run shot in the bottom of the 12th. With Roger Clemens on the mound Houston took a 2-0 lead in game seven. But the Cardinals eventually got to Clemens and with their 5-2 victory the Redbirds took the only league championship series to ever feature two walk off home runs. The expanded playoffs gave the Yankees and Red Sox yet another forum in which to continue their rivalry, and New York had defeated Boston dramatically in the 1999 and 2003 ALCS. Their 2004 League Championship series also got off to a wild start with Yankee ace Mike Mussina pitching a perfect game through six innings only to see a late-inning slugfest breakout and a 10-7 victory for New York. The Bronx Bombers then took games two and three. A quick sweep seemed in order when Mariano Rivera took the mound in the ninth with a 4-3 game four lead. But the all-time great closer blew the save and Boston prevailed in the twelfth on a walkoff David Ortiz homer. Game five went to 14 innings with Ortiz again delivering the walkoff hit, this time a Johnny Damon scoring single. Game six was the legendary bloody sock game, in which Curt Schilling shut the Yankees down while pitching with a torn tendon sheath in his right ankle. Doing what no team in baseball history had ever done before, the Red Sox completed their comeback from a 3-0 series deficit by defeating the Yankees 10-3 in game 7.